A swift journey will take you to the Capital of Culture 2016. Wrocław, the City of 100 Bridges will enchant you with its splendid Gothic Old Town! 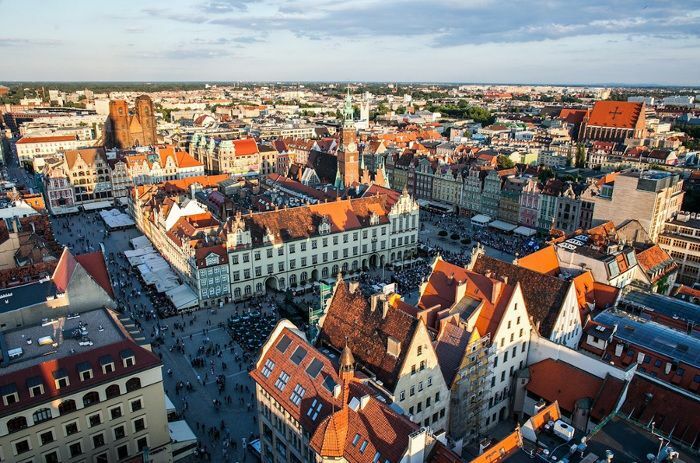 Wrocław city tour starts with the Old Town, splendidly reconstructed after the II World War, where you can admire a fine example of the Gothic architecture – the Town Hall of Wroclaw. Have a stroll around the Old Town till you reach the inconspicuous building hosting the famous 114-meter wide Racławice Panorama, a painting commemorating the 100th anniversary of the Battle of Racławice (4 April 1794), one of the Polish victories during the Kościuszko Insurrection against the Russian army. This tour starts in Lodz. You will be picked up by our English speaking driver from your hotel. Afterwards driver will transfer you to Wroclaw for the lunch in one of the restaurants where mostly locals eat. Then our local guide will take you for private tour around Wroclaw. After the tour you will come back to Lodz around 19:00. Prices start from 75EUR and they depend on the number of participants. We are trying to have as many travelers at one time, from different hotels in Lodz, in order to give you better price. Private tour +25% to your price if you require that no other people join your tour. It depends on the number of participants. We are trying to have as many travelers for each tour as possible. We gather the group so even if you are alone and there are 7 other people you pay only 75EUR. However, if there are e.g. 3 people including you the price is 134EUR. Why I have to pay 320 euros if the price starts from 75 euros? There is no maximum, if there is 8 people or more the price will be 75EUR. Yes, if you are the only one person for the tour and there is no other participants the price will be 320EUR. The travel from Lodz to Wroclaw is about 2h 30min. How long does Wroclaw tour take? The Wroclaw tour takes 2h. I want to stay in Wroclaw after tour, is it possible? Do we have free time in Wroclaw?